Upcoming L.A. Noire's first paid-for DLC, the "Nichlson Electroplating arson case", launches for PlayStation 3 and Xbox 360 on 21st June. Rockstar now lists the new content on its site. Gamers who bought L.A. Noire at a Best Buy midnight launch event are able to nab the add-on for free. Word of the DLC leaked earlier this week after being spotted on Best Buy flyers. It's listed as the "first DLC pack", rather unsurprisingly implying more DLC will follow. 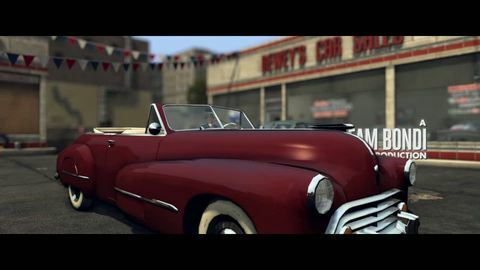 Rockstar has been silent on its post-release L.A. Noire plans, although the title launched with a raft of pre-order exclusives the developer has promised will later be made available to all. There's also that mysterious Rockstar Pass, promised to launch for the game this week, but is nowhere to be seen. Solve every case and more with our LA Noire guides. Maps and screens of all Golden Reels. Use our maps to assist with your 1940s sight-seeing.